IGBO Leaders of Thought, ILT, has picked holes in the comments of Director General of Voice of Nigeria, Mr. Osita Okechukwu, that Igbo presidency instead of restructuring would address marginalisation of the Igbo and to realise the quest in 2023, the Igbo should support President Muhammadu Buhari’s re-election, next year. 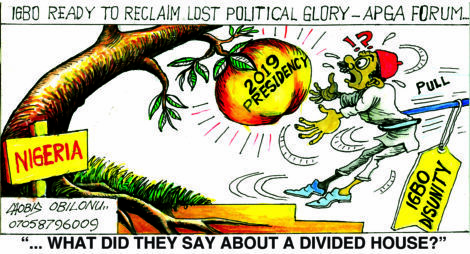 Responding yesterday, Deputy Secretary of the ILT, Evangelist Elliot Ugochukwu-Uko faulted Okechukwu’s position, saying: ‘’The infantile narrative that Buhari would grant Ndigbo the presidency of Nigeria in 2023 is a narrative from the pit of hell. When will Okechukwu realise that he is entertaining the humiliated, alienated, much abused but highly intelligent Ndigbo? When will Okechukwu realise that he is merely speaking to himself and probably deceiving his masters in the bargain?